A Japanese version of this list (WIP) can be found here. Special thanks to abc_ore for working on it. This list is also now hosted on GitHub to make updating and tracking easier. The list here will still be updated every once in a while, but the most up-to-date version can be found there. There is also a list of glitches that need more information to be added, so be sure to check that as well. The aim of this list is to provide information that can be used to recreate glitches, and the ones on that list don't have enough information to accurately do so. If you know anything about them, please be sure to say so! Also, if you're curious about what the most recently added gliches are, recently added or updated ones will have a green NEW! next to them. The list is regularly updated, so you may want to check every so often for new additions. Update 9/24/2017: Passed well over 600 glitches now (623 total!). Four Five Six Seven years ago, a thread was created to finally collect and list every single known glitch in Super Mario World. However, the thread became largely unorganized, full of misinformation, and died out by the end of the year. I've decided to try and revive the idea behind this list, and have rewritten and checked everything in the old list, as well as added several things that weren't on it; the result is what follows. Before I actually post the list, though, there are a few things to say about it. One of the problems with the old glitch list is that it was largely unorganized. Unfortunately, this new list doesn't really solve that problem. SMW has such a large array of glitches that it is incredibly difficult to list them in a comprehensible and simple way. The method I ended up settling on is quite similar to the old one; there are a total of five categories - Physics, Yoshi, Items, Misc, and Crashes - with two divisions: useful, and useless. The glitches are divided based on the priority of what is needed: If it requires a Yoshi at all, it will always go in the Yoshi category; if it primarily requires carriable sprites (but not Yoshi), then it will go in the Items category; if it uses any other sprites, it goes in the Misc category, and if it only involves Mario, it goes in the Physics category. Anything that softlocks, hardlocks, or crashes the game will go in the Crashes category, of course. As for the useful/useless split, "useless" glitches are defined as those that are purely cosmetic or at least have incredibly limited use, and generally involve graphical or sound glitches. "Useful" ones, on the other hand, are glitches that can in some way be abused to achieve some effect. Also, if a glitch has more information or a fix readily available, links are provided for it. Sprite slot: Most sprite data is stored in tables, and we call the part of the table that a specific sprite occupies a "slot". In SMW, there are normally a total of 12 slots, numbered #0 through #11. In addition, these tables are split into two divisions: the first consists of standard sprites and generally uses some range of slots from #0 to #9 based on the sprite memory setting, while the second division of all other slots contains only "important" sprites that come from the item box or blocks. Depending on the slot a sprite is in, it may act slightly different in its interaction with Mario or other sprites. For reference, a "lower" (toward #0) slot will appear visually on top of a "higher" (toward #11) slot. Permanent sprite: Normally, when a sprite is far enough offscreen, it will despawn and won't come back until its original spawn position is reloaded. However, certain sprites have a bit that makes this not happen; once you spawn them, they're going to stay there until you either destroy them or throw them below the screen into the game's "death zone". A few examples of common permanent sprites include the solid carriable items like P-switches and keys, directional coins, released item box items, and goal tapes. Priority: If all of the game's available sprite slots are filled, then usually the game will stop spawning any more sprites. However, this is not always the case; certain sprites, such as the goal tape, will take priority over other sprites, and as a result, one of these other sprites will be erased in its place. Note that this is unrelated to graphical priority, which determines the order sprites and layers will be displayed in when overlapping. Stun timer and stunning: This refers to a table at $7E1540 that many sprites use as a timer for their various states. For example, Goombas use this to determine when to flip back over, and items will use this to determine when they finish rising out of boxes. The interesting part about it, however, is when objects are stunned when they aren't meant to; this usually causes sprites to spawn another sprite with them, in a manner similar to that of a Koopa shell when a Koopa hops out of it. A few examples with this include spawning a fish with P-switch or a Koopa with a shell. Null sprite: A "null" sprite is a nonexistant sprite (well, to be exact, its sprite slot is #$FF), created when the game registers Yoshi as having a sprite on his tongue or in his mouth that isn't actually there. There are multiple ways to create this, and spitting it out will have some very strange effects on other sprites. Air: This is a bit of a questionable term that refers to the boost Mario recieves when pulling back while flying. When refering specifically to the extra large boost that Mario receives after diving, we use the term "big air", which despite sounding dumb describes it pretty accurately. 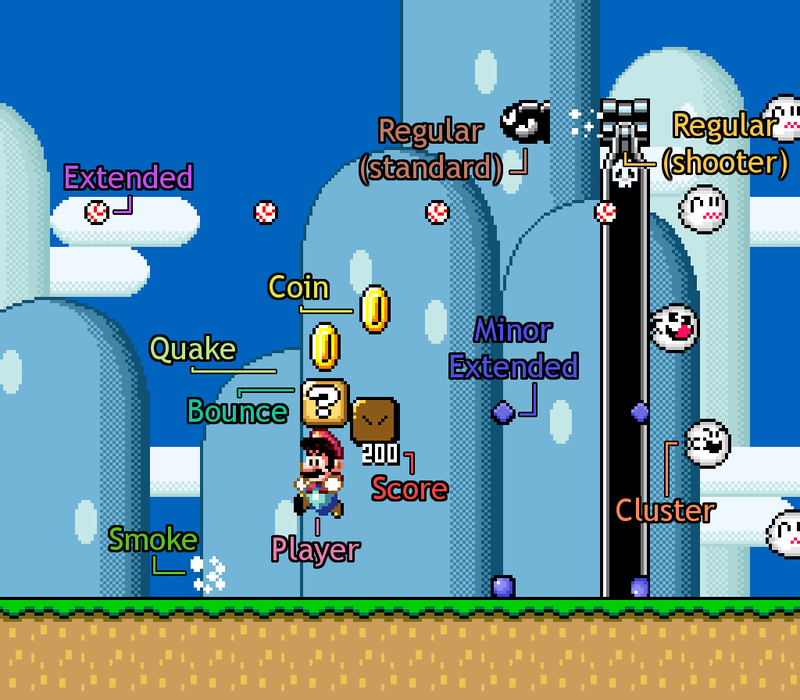 Sprite Types: In SMW, there are 11 types of sprites: normal, extended, minor extended, cluster, overworld, bounce, smoke, score, coin, player, and quake. Normal sprites are the sprites defined by SMW's sprite data, though it is also divided into three types (standard, generators, and shooters), each which use their own set of addresses. Extended sprites include additional interactive sprites, such as fireballs or baseballs. Minor extended sprites are similar, except they don't interact with Mario (the Boo stream seems like it would be the exception, but that's handled by the main sprite). Cluster sprites are special groups of sprites which are handled by a single regular sprite, such as the Boo ceiling (Boo rings are also included in this, but they function somewhat separately as well). Overworld sprites are, obviously, sprites specifically used on the overworld maps. Bounce sprites are the short animation sprites used when blocks are hit by Mario. Smoke sprites are minor timed animation sprites, score sprites are the animation tiles used to display point values when Mario bounces off a sprite, and coin sprites are the spinning coin animation that appears when coinblocks are hit. Player sprites, of course, refer to Mario and Luigi. Lastly, quake sprites are the invisible interaction spaces generated by blocks when hit and by Yoshi stomping the ground with a yellow shell in his mouth. Each of these sprites use separate tables for data such as positions or speeds (the only table they share is the OAM table), but sprites that are of the same type often have issues when the tables containing their data are filled up. Examples of most of these types can be found in this diagram. Frozen: In this list, the terms "frozen" and "freezing" do not refer to when the game is broken in such a way that it has to be reset to continue playing; that refers to the term defined below. Instead, frozen refers to a point in the game where the sprites of the game are locked in place briefly. Generally, this is done by the RAM address $7E009D, which is set by screen scrolling, Yoshi hatching, transformations, pipes, death, or keyholes (pausing, message boxes, berries, and doors, however, do not use this address, but as a result have their own distinct glitches as a result). While most sprite processes are stopped by this address, often there are parts that keep running regardless, and as a result sprites will do some odd things. Softlocks and hardlocks: Softlocking is a general term for when the game locks up or freezes, but does not actually crash. In this list, I use it to refer to situations where that kind of event occurs, but Mario still has the ability to pause and Start+Select out of the level. The converse to this is a hardlock, in which the player can not do anything, though the game continues to run. A crash, meanwhile, is when the game starts reading incorrect code and completely breaks or stops. 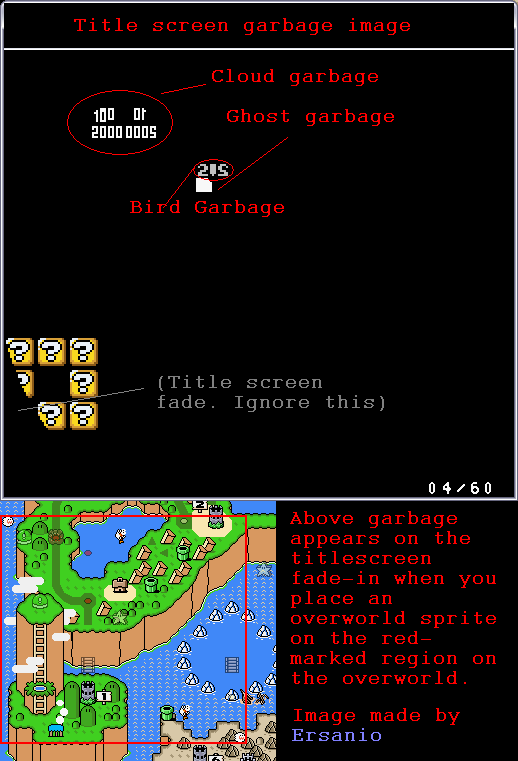 It should be noted that any crash yielding multiple results may be manipulatable, which means if you are able to figure out the RAM address causing the crash and can change it as needed, it is possible to create any effect within the boundaries of the SNES (see SMW arbitrary code execution). This is actually where a few glitches, particularly those relating to null sprites, get their most useful effects. Softlocks and hardlocks, however, are not so useful, and can usually not be manipulated outside of a few small variances. And finally, the last thing I have to say before the list is that this is not complete. It is quite likely that it is missing already-known glitches, especially those that have been found in the four years since the old one. If you have any glitches you don't feel are on the list, feel free to post them, and if they can be reproduced, I'll add them on. Just be sure to check and make sure that it's not already in the list beforehand, by pressing CTRL+F and searching for related keywords. There's also a list of glitches that are known but have yet to be specifically confirmed, which is linked above. As for anything else you're confused about, you're free to ask any questions, and if there's particular confusion over the wording or requirements for a glitch, then I'll fix it as needed. And with that all out of the way, let the list begin. Smashola: Doing the above through turnblocks while caped and spinjumping may cause Mario to "warp" his way downward very quickly. Clipping into an upside-down slope will force Mario on top of it. This can also force him inside blocks, killing him. If Mario hits the vertical screen barrier while walking up a slope, he will fall through the slope. If Mario is moving fast enough (x-speed of 64-80), then Mario will be unable to jump. Any faster and his jump height will also be significantly higher than usual. If Mario clips far enough into a wall and dismounts Yoshi there, the game may consider Yoshi to actually be inside the wall, causing him to climb up it. If Yoshi ends up inside a block, you will be unable to move out of the block without jumping. Eat-canceling an item: If Mario is hit off of Yoshi while an item is stuck to Yoshi's tongue, that item will be dropped off of it while retaining any properties it had while stuck to the tongue. This can allow for a variety of effects, including causing sprites to lose (some) vertical object interaction, moving normally immovable sprites, and more. NEW! If a Yoshi is sinking in lava and another Yoshi is registered on his tongue (by getting a sprite on his tongue, despawning it, then spawning Yoshi in the same slot), and Yoshi is set to hatch an egg from berries, then standing on the ground so that this egg is spawned will freeze sprites as normal (through $9D) but Mario will still be able to move around. NEW! When spawning a Yoshi from a block while another Yoshi is sinking in lava, Mario will still be able to move around during the new Yoshi's hatching animation. However, $9D will still be set (freezing other sprites in place), meaning any glitches resulting from it can still occur in this time. If Mario is holding an item when he switches layers, the item will become stuck to Mario and he will be unable to let go of it, even if Y and X are released (this also means Yoshi can not be ridden). In addition, if Mario goes to another room, this item will be taken to that room as well, even if he doesn't enter through a door; it will appear at whatever position it was at when Mario exited the previous room. Berries don't work correctly in vertical levels. Yoshi will be unable to eat them most of the time, and when he can, they won't disappear; instead, an empty green bush tile will appear a screen below the berry's actual position, and the berry itself can be eaten an unlimited number of times. NEW! If a level has a no-Yoshi entrance and Mario dies in the level with a Yoshi, he'll keep the Yoshi when he exits to the overworld. NEW! If a level has a no-Yoshi entrance and Mario enters the level with a Yoshi, then mounts a new Yoshi in the level and dismounts him, he'll lose the Yoshi on the overworld as well. Beating the level without dismounting this new Yoshi will simply replace the original with it. Throwing a shell upwards on the frame it is about to sink in lava will cause it to reset to it is initial state. In other words, it'll suddenly have a Koopa inside it. On the frame the shell touches the lava, Mario can also bounce off of or be damaged by it, as well. NEW! If a blue Koopa and a dropped carryable item have opposite "facing" directions ($157C), then the item will warp in front of the blue Koopa when it touches it, regardless of their relative positions to each other. Note that the "facing" direction of a carryable sprite is not the direction it's actually moving in; instead, it's the last horizontal direction the sprite was moving in when in a non-carryable status (alternatively, it can be inverted by bumping off a wall). NEW! Mario can spinjump off of throwblocks on the frame they shatter from hitting a block. NEW! Mario can spinjump off of throwblocks on the frame they turn into a cloud puff from their timer running out. Duplicating a block into a Yoshi coin and then grabbing the Yoshi coin will turn the block into tile 125; this tile has the potential of spawning a key, Yoshi wings, P-balloon, or shell. Note that if the block you duplicated was a turnblock, you'll have to wait for it to stop turning before collecting the coin. If a coinblock is placed too high in a bonus room, it will cause Mario to immitate a P-balloon when hit, except the P-balloon neither wears off nor can be controlled; Mario will only move with whatever inertia he had when the block was hit. 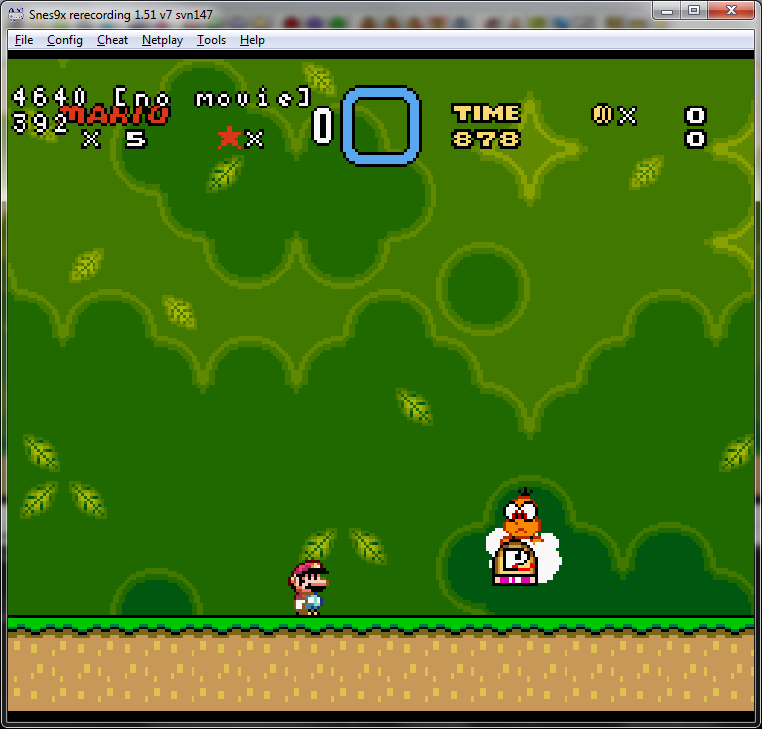 Collecting a powerup on the frame a Yoshi egg lands on a block will cause its graphics to glitch briefly. NEW! If a Koopa has just entered a Koopa shell, setting $15D0 (flag for being on Yoshi's tongue) for a sprite in the same slot the Koopa was in will cause the Koopa inside the shell to vanish without actually emerging. NEW! During the brief period after a Sliding Blue Koopa comes to a stop (before it starts walking as a normal Blue Koopa), it will no longer update it's position or interact with blocks, so removing the ground from below it will cause it to just float in midair for a bit. NEW! Sliding Blue Koopas will constantly bounce when trying to slide upwards on a slope. NEW! The block containing a roulette sprite doesn't actually have to be hit in order for it to start rising out. Instead, a nearby block, capespin, net punch, or Yoshi stomp will suffice, so long as their quake sprite comes into contact with the roulette sprite. NEW! The roulette sprite won't interact with the sides or bottoms of solid blocks for a brief period of time after being spawned out of its block, causing it to bounce up on top of them if it does hit any blocks. Being pushed inside a solid sprite (e.g. message box, turnblock bridge, Hammer Bro platform, Bowser statue...) will cause Mario to warp to the nearest side, even through solid blocks. If the camera moves sharply, this may also cause the newly loaded columns of Map16 to have glitched graphics until they're reloaded. Possible ways of doing this include being pushed in by another sprite, jumping fast enough, or wall running via a purple triangle. NEW! When being 'warped' by a solid sprite, it's possible to completely pass the screen's spawn region over a sprite, preventing that sprite from spawning at all. Hitting a message box that isn't set to contain a message box will cause it to instead load the Yellow Switch Palace message. If $1DF5 is non-zero, the level will automatically end and activate the Yellow Switch shortly after the message box appears; else, exiting the level by any other means (dying, goal tape, start+select, etc.) will achieve the same effect, although this will not count as beating the level. This is fixed by default by Lunar Magic. NEW! While on the backside of a fence, Mario will still interact with: wall springboards, the Fishin' Boo's flame, the Dino Torch's flame, and Wigglers. NEW! Freezing the game (via $9D) while the Falling Spike is falling will cause its Y speed to reset. NEW! The Falling Spike sprite doesn't actually interact with Mario until it starts to fall. NEW! Mario can pass through the bottom half of the grey castle block sprite so long as he has no upwards Y speed. As a side effect, it also won't force small Mario or a ducking big Mario into walls. NEW! Hitting the grey castle block sprite from below when $C2 is 0 (where the block will be stationary before moving left) will cause it to immediately start moving left. NEW! Mario can fit between two Wooden Spike sprites without being hurt, even if they're directly next to each other. NEW! Mario doesn't actually have to be touching the spike part of a wooden spike to take damage; the entire interior will hurt him. NEW! Mario can vertically pass through a Wooden Spike sprite without being pushed out, so long as he enters them directly through the top/bottom (but he will take damage in the process). NEW! The Hopping flame's remnants normally don't hurt Mario when they're flickering, but freezing the game (via $9D) will still cause him to get hurt by them. The moving Ghost House hole sprite will allow Mario to fall through any solid block as long as he is touching it, not just through the blocks it actually covers. NEW! For 30 frames after the Clappin' Chuck claps, it won't be killable by capespins or quake sprites. NEW! Hitting the Boo Block from below when it's semi-solid will cause it to immediately become fully solid. While wall running, Mario will ignore the standard function of whatever he is running up, so long as it is solid some of the time. This means he can run up munchers, any kind of ledge or slope, tile-set specific lava, noteblocks, and even other purple triangles. This effect also lasts for a frame after he reorients at the top, allowing him to jump normally. Additionally, he will also run through any blocks that aren't always solid on his way up the wall, including upside-down slopes, standard lava, and water. Mario will "stick" to any platform sprites while running up walls via a purple triangle, slowing him down to the speed of the platform until it passes by. One notable use of this is that it even applies to the animation at the end of a wall where Mario reorients himself, but his horizontal speed will remain unaffected, which can cause him to clip into the tiles in the next column over. It should be noted that this works with the solid platform sprites as well, but only if Mario enters at a position where he doesn't get warped out of it. NEW! Keyholes will still function during the goal walk. If Yoshi has a key in his mouth during it, it can actually be activated (thus activating the secret exit on the overworld instead of the normal). NEW! Keyholes will still function when exiting or entering a pipe, so carrying a key through the pipe can activate it. When placed next to a screen border, both the screen exit on that screen and the one the door is touching can be accessed depending on Mario's position. NEW! If a level has Layer 3 tides active and is less than 3 screens long, then sprites anywhere on the screen can occasionally register themselves as being in water. In 1- or 2-screen rooms, the effect will occur longer and more often the further left the screen is; in 3-screen rooms, it will only occur right of the screen when the screen is all the way at the left edge of the level. NEW! The ability to side-screen-exit is carried across sublevels. NEW! The Rip Van Fish will center vertically on tiles if it falls on them while asleep. This can cause it to "bounce" if it lands on a slope or similar block. NEW! Hitting a directional coin block while Mario has star power will cause the music to be overwritten by the directional coins; however, if the coins end before the star does, the music will continue to play for the directional coin path until Mario's star power ends as well. NEW! If Mario is touching the top of a moving platform while holding onto a fence or vine, he will be "pulled" by the platform while still climbing. Eating certain sprites via item swap may crash the game. Collecting powerups with a powerup status greater than the fireflower may cause the game to crash. Some stunned sprites may crash the game when attempting to spawn an invalid sprite. TASVideo's SMW Game Resource page - Includes a good amount of information on the basic glitches of SMW. Also provides a lot of information on TAS tricks, which may be useful to pit hackers. 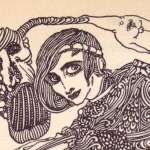 SMWWiki's glitch page - Provides information on several glitches, along with videos showing how to do them. nathanisbored's Let's Glitch SMW series - A helpful commentary playthrough of SMW showing and explaining many of its possible glitches along the way. A list of the glitches shown and when can be found here. SMWUtils - A useful lua script for Snes9x, lsnes, and Bizhawk that displays a variety of information onto the screen, most notably sprite slots. Block Info - A script that displays clipping information for blocks. Useful for walljumps, corner clips, and block duplication. Japanese version of this list - Special thanks to abc_ore for this. If you're stunned while in the air, you can jump for a brief period of time. While the eating block absorbs the properties of the sprites it eats, this is glitched to some extent. For example, you can stay on the leftmost pixel of it while it absorbs blocks set to act like tile 12F. The eating block will not eat blocks that bounce as it passes through it. The block will remain in the same position. I will test if it can be eaten again shortly but have no reason to assume it can't be. You can stand on the eating block as it eats blocks set to be solid to sprites. I'm not sure if this applies to tile 1F0. If you are on a flying platform (I discovered it with 9C) and you get stunned, you stay in the same position, but the platform flies as it would normally. You have a couple(?) of frames after you get stunned where Mario is still acting as if he's on a flying platform, which means he can jump. The reason I suspected that the eating block absorbs the properties of the block it's on is because if you touch the eating block while it is on the "solid to sprites only" block in the blocks section of the site, it acts solid. As I said, I never tried it with blocks 1D8-1E4 and 1E9-1FF, so I'm not sure how it interacts with those blocks, but I have a feeling that your description of how the eating block works isn't quite complete. If a block becomes passable to sprites somehow while the eating block is on it (For example, on/off custom blocks, presumably coins as well), the eating block will continue passing through it. This makes sense due to how the eating block interacts with bounce sprites but I thought it might deserve mention on its own. As for the second and third things, those involves custom blocks, which this list is trying to not include (particularly since any case of bad coding would lead to glitches). If you can find any case of this happening with SMW's original blocks, though, I can add them on, but I tested with a few ones and didn't see either of them occurring. If you hit a Bowser Statue that is set to do nothing but sit there from below, it will start spitting fire. I don't know if this is a glitch or not, but I feel the need to note it somewhere. That's already in the list. A simple ctrl-F of "bowser statue" would have confirmed that. Is there a way to patch this up? I'm currently working on an intricate water level filled with rip van fish, and this could be a factor of cheating. Not sure if this is a 'glitch' but eh. When Yoshi is inside a cloud block with a one-tile high space above him, you can mount Yoshi as small Mario by jumping at the correct time. Tried to look at the patches section and couldn't find any sort of fix - unless I'm wrong, you might have to plan around it, especially since the rip van fish can take a long time to get through the blocks while sleeping. Tested it before you found it and looks like it could be a glitch useful for certain situations, but it's very similar to the one when I can get pushed through the floor while on Yoshi. Waiting for Thomas' opinion on this, as I'm not quite sure yet. especially since the rip van fish can take a long time to get through the blocks while sleeping. I wonder if a lower time limit could help discourage waiting for that. Ah, completely forgot about that. You don't actually need a one-tile space for it, though; you can do it in any size space as long as you clip far enough into the block while Yoshi is bouncing upward. For the Rip Van Fish thing, it's because the code for it just zeros its X speed without actually pushing it out (meaning it can still increase its speed for a frame before it zeros again). I don't think there's a patch for it right now, but you can do it with a quick hijack at $02C010. This happens more easily when there's a block over Mario, but it's not necessary. Yoshi bounces and when he is in the highest spot, his hitbox area is above the cloud. So if Mario is falling and is 1 pixel higher than the cloud at the same time Yoshi is in the highest pixel, they will collide. Releasing an item from the item box will cause it to continue cycling vertically throughout the level until Mario collects it. Its interaction will even loop every two screens as well, so you can grab even if you can't see it. 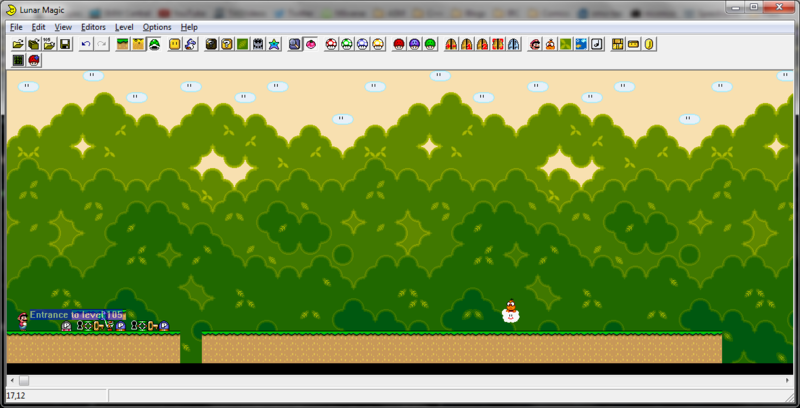 Another one: in vertical levels, sprites will not disappear if they fall below the line in which Mario dies. Non-permanent sprites only disappear if they are vertically far away from the screen or horizontally outside the level. That means that permanent items, such as Keys and P-Switches, can be dropped in a hole and cycle the level like a Powerup. As it falls 4 times faster, you don't need to wait too much. Alright, added. Seems there's also potential for items to loop horizontally across the level in horizontal levels as well, so long as they don't fall vertically off the screen. You'd need some other kind of glitch or a custom sprite to do that, though. I noticed that in Super Demo World, Desert Pyramid, when I dropped the key in the lateral screen and it didn't disappear. If the x_speed is 64 too, the key will loop in both directions, almost falling onto the top of the level. Throwing the item away in the correct position may allow that to happen and can be abused in pit hacks. Added, kind of. When I tested, it was the actual letters that didn't appear, not the entire message. Also, the same occurs for every message box, regardless of what's spawning it. I guess it has to do with the color math or something? That's pretty weird. When testing, I also found that if slot 0 contains an offscreen P-switch or key, it will be "stuck" to Lakitu's cloud. It's just a graphical glitch, though. Example. 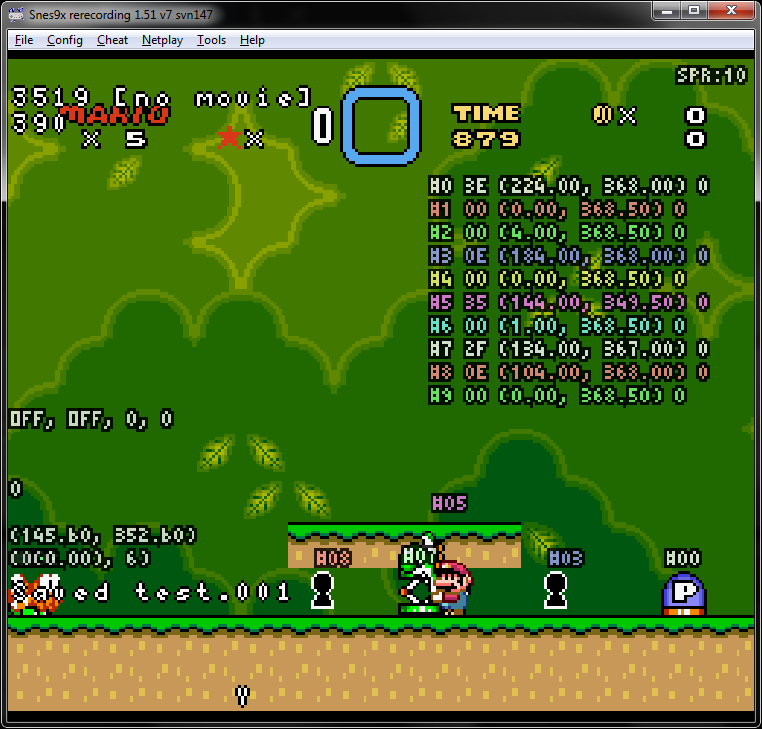 Additionally, while throwing some items into a pit, a bunch of Koopas randomly filled all empty slots. This is known to happen with bullet bill shooters on the rightmost edge of a level, and it's happened for unknown reasons to me before. The setup for the sprites was like so, if you want to mess with it.